In this design by Barbara Paul, a diverse collection of trees, shrubs and perennials fill this large corner lot with color and help nestle the home into the landscape. Before: Whether it's weeds or out-of-control groundcover, the front yard is a jungle. After: Low-maintenance plantings and the sharp, clean lines of the new wall tie in with a bright new paint job on the house. Before: The interior of this Phoenix home reflects the eclectic style of the homeowners and their love of Spanish-Colonial and Tuscan decor, but the front yard looks more like a moonscape than a landscape. The homeowners want a circle driveway and a front courtyard. After: The dramatic design combines natural desert beauty with the Old-World style the homeowners love. In addition to the circular drive, they'd wanted a Xeriscaped landscape, so the mix of plants includes agave, desert willow and small cacti. Lantanas and potted geraniums provide plenty of color, and an enormous saguaro cactus confirms that this home is a desert hideaway. Before: This city home has failing retaining walls and an unwelcoming entryway. After: The retaining walls are gone. Large, decorative boulders, new stairs and sun-loving plants guide visitors to the front door. Designer's tip: Coordinate plant material with the color of your home for a finished look. Before: The concrete steps leading to this Seattle home are steeper than they look and are cracked, uneven and worn. The reward for making this climb is a yard full of dead grass, plus more steps up to a postage stamp-sized front porch. After: Wider steps and two new terrace levels break up the space (and the climb) while creating new living spaces. A much larger deck helps conceal the garage area and gives the homeowners a perfect vantage point to enjoy their view of the Seattle skyline. Before: The homeowners love their cute, trendy Venice home but not the chainlink fence, tired lawn and unimaginative concrete walkway. They want tropical plants that are better suited to the diminutive size of their California garden. 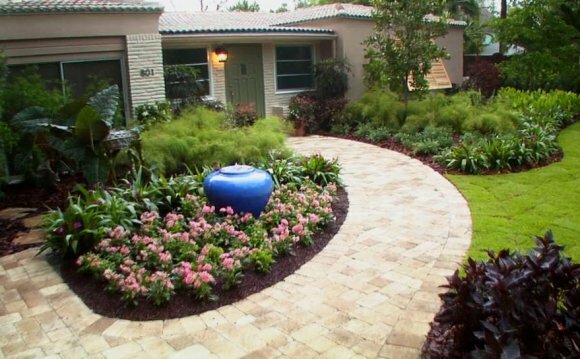 After: A custom curved fence, quartzite-paved hardscape and an abundance of tropical plants combine to create a dramatic entrance to the front yard. Before: A yard that's bare except for weeds does little for the boxy, spare look of the home. After: A stunning new look, thanks to new stone walls, lush landscaping and shutters. The plantings include shrubs and perennials that will provide color and interest throughout the year. Before: A fenced-in yard, no sidewalk to speak of and a tiny front porch don't welcome visitors. And, by the way, a little color wouldn't hurt. After: The upgrade includes a fresh coat of paint on the house and low-maintenance landscaping. A new front deck invites easy visiting with neighbors.